Vampire Weekend, the band composed of four Columbia University graduates who met in college, has been missing in action since the release of their third studio album, Modern Vampires of the City, which was released in May of 2013. Modern Vampires of the City is the album that would clinch the Best Alternative Album Grammy award for the group, their first Grammy win and second nomination after their sophomore release Contra was nominated in 2011. 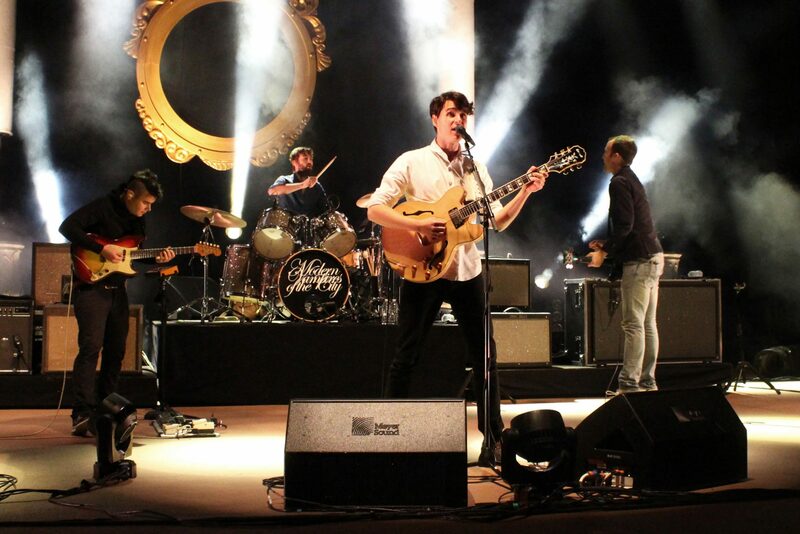 Led by frontman Ezra Koenig, “Harmony Hall” and “2021” come after the band went through some major changes in 2016 — notably the departure of bandmate Rostam Batmanglij, though Batmanglij continues to work with the band and even co-produced “Harmony Hall.” The lead guitar that starts off track one, “Harmony Hall”, sounds similar to something you would find in an old school country track, but leads into a piano riff that seems like it came fresh off of a George Michael ballad. He continues by singing over the 80s inspired piano melody by repeating, “I don’t want to live like this/But I don’t wanna die.” The song alludes to the constant problems that seem to be popping up not only worldwide, but especially in the government struggles under Trump. Koenig, a known Bernie Sanders supporter, has made it known he is not the fondest fan of the current president. With a hiatus of almost six years, it makes sense that the band would focus on making an impact with their music, but regardless, it’s nice to hear from Vampire Weekend after over half a decade without any new tracks. Their fourth studio album, titled Father of the Bride, has subtle vibes of previous albums, though their self-titled debut and sophomore album Contra create the façade of summers in Cape Cod at a family’s beach house, where Modern Vampires of the City has more of a heavy rock influence behind tracks like Finger Back and Diane Young. The second track to accompany Vampire Weekend’s return to music is called “2021.” The track is only one minute and 38 seconds long and has a toy piano inspired melody that runs through the background as the auto-tuned voice of Jenny Lewis repeats the word “boy” when Koenig isn’t singing. 2021 also can be perceived as another political venture through music as Koenig repeats the exact same verse twice through the whole song. Koenig is a Jewish-American and ex-guitarist Batmanglij is openly gay, both identifiers that are not supported by the Trump administration. “2021, will you think about me?/I could wait a year but I shouldn’t wait three/I don’t wanna be,” Koenig softly sings on the track as he doesn’t say much, but says everything at the same time. 2021 is the year a new president could possibly come into power, and Koenig is asking listeners to consider others when they vote as the voting that took place in 2016 is the cause of what currently is happening in America.